In contrast to headline news today, the weather seems perfectly harmless — until one looks carefully at these maps. Though increased soil moisture levels may be a big improvement over this past summer’s drought, a serious problem remains: there’s been too much late snow and it’s going to melt quickly. Based on the 21-MAR-2013 hydrologic map above, conditions along the Red River basin were quite bad; changes of major flooding were already predicted at that time. Since that report, the State Climatology Office at University of Minnesota recorded 4 inches of water (which includes 13 inches of snow) at their Twin Cities campus. This same station, however, received between 6-15 inches less snow over the last month than Fargo, North Dakota, located on the Red River. 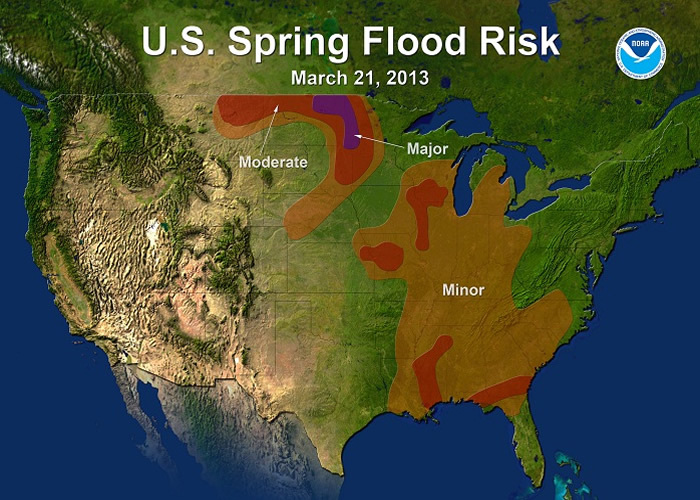 The data used for the Percent Chance of Flooding map below is dated 15-APR-2013, before the final snowfall tally after The Weather Channel-branded winter storm “Xerxes” on 16-APR-2013. 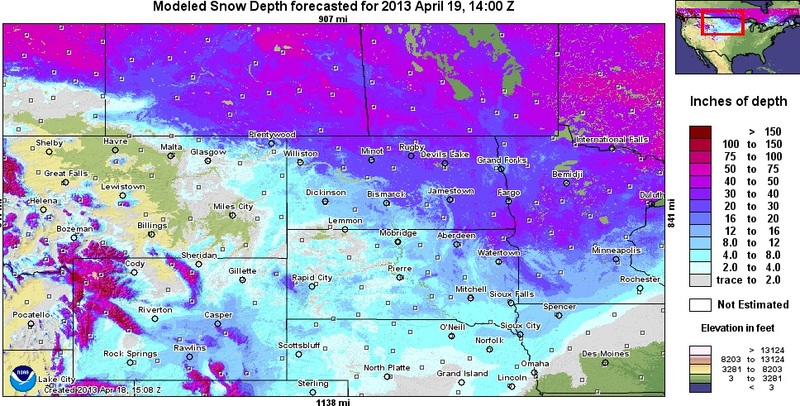 The area between Bismarck and Fargo received at least two feet of snow. Brian Beutler has a post predicting that Eric Cantor will do the same thing with Irene disaster aid he did with hypothetical aid to his own constituents after the earthquake: demand budget cuts to pay for any aid. 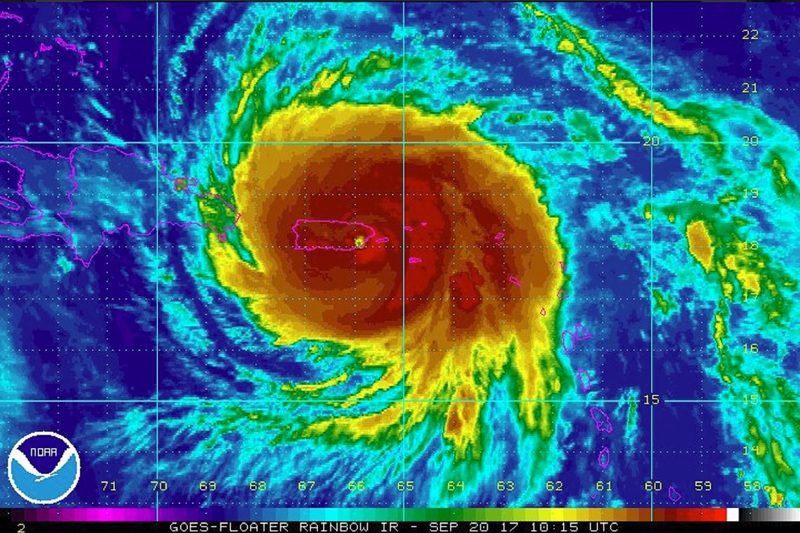 Now, in the wake of Hurricane Irene — a much costlier natural disaster — Cantor may make the same demand, which could touch off a bitter fight on Capitol Hill. At issue is, in part, the number of disasters FEMA has had to respond to, which has sapped its disaster release funds. It is now at $792 million, congressional sources said Friday. Normally when the fund dips below $1 billion, FEMA announces it can only meet the most immediate needs such as clearing debris. On Saturday FEMA announced that because the fund had reached $792 million, it had in fact reached immediate needs status. Before Hurricane Irene and the Virginia earthquake, 2011 saw historic Mississippi river valley flooding, North Dakota flooding, and massive tornados in the Midwest and South. The agency told Congress this summer it could need up to $4 billion more in funding for a total of $6.8 billion in 2012. Add to that the $2.6 billion in estimated insured losses with Irene (though as much as a billion of that is in the Caribbean) and at least 25 deaths in the US, and those billions and those deaths begin to add up. Yet in response, the Republicans have been targeting programs–like clean energy vehicles–as their “offsets” to disaster funding. At some point, we’re going to need to address this as “climate change” rather than just “serial Mother Nature” requiring budget offsets. Perhaps the way to force that issue is to point out who is suffering because of this. The biggest number of deaths came in Alabama and Missouri, not the elite East Coast. The big damages came in states like Texas, Oklahoma, Missouri, Alabama, Tennesee, the Dakotas. Climate change exacerbated weather events are devastating red states as much as the blue states Irene just hit. It is time to stop treating them as discrete events, paid for by cutting some of the same core government functions helping to deal with climate change generally. If Republicans are going to make this a fight, it’s time to finally start pointing to how climate change denialism is killing the constituents of those denialists.